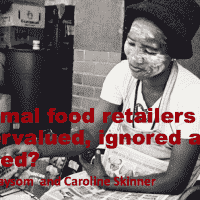 Home » Presentations » Informal Food Retailers – Undervalued, Ignored and Abused? Informal Food Retailers – Undervalued, Ignored and Abused? A presentation by Gareth Haysom and Caroline Skinner. given at the Society of South African Geographers Conference in Stellenbosch, 27 September 2016. The presentation is entitled Informal Food Retailers – Undervalued, Ignored and Abused? Over the last 10 years my research has interrogated the nature of the informal economy and informalisation processes in South Africa.A persistent theme has been to understand how urban social movements, policies and governance shape the living and work environment of the working poor. What does a ‘smart’ African city look like?